Please note: These positions take a little more caution than the front-carries. Please have another adult nearby to assist you when you are first practicing these positions, especially with small infants! These directions are written as though you were alone, but it is a good idea to have someone helping you at first anyway. 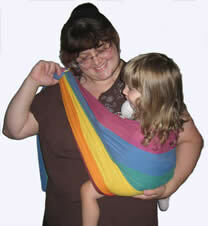 If you have another adult nearby, you can start with the sling rings in front (in their normal position) and just have your partner put the baby in the sling. The following can be helpful when you are alone (given the caveats above). 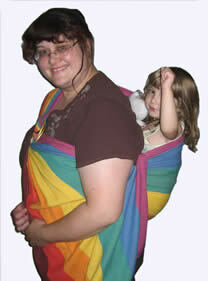 Start with the rings in the back as above, and put the baby or toddler in the hip carry. Make sure the fabric is above a baby's shoulders, and at least up to a toddler's armpits. 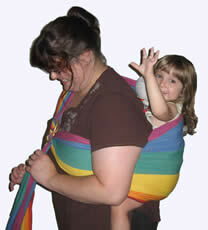 Keeping one hand on the child, lift up on him slightly while pulling the rings forward, transferring her to your back. You can keep her either on you hip behind your arm, or higher up on your back, as though you were carrying her piggy-back. Either way, make sure the fabric is high on her back the whole time (check frequently in a mirror or with a friend), especially if she is prone to arching her back. 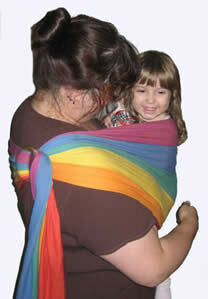 I like to tuck the tail into the sling behind me, to hide what the sling does to my breast when Sophie's on my back!